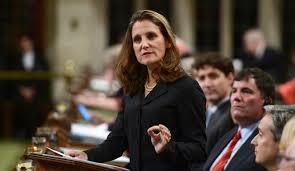 Canadian Foreign Minister Chrystia Freeland will arrive in Ukraine on a working visit on August 28. This was reported by the press service of the Canadian Foreign Ministry. It is specified that in Ukraine Freeland will arrive after a trip to Germany. "On August 28, the Minister will visit Ukraine, where she will meet with President Petro Poroshenko, Prime Minister Volodymyr Groysman and Foreign Minister Pavlo Klimkin. Earlier Chrystia Freeland, the Foreign Minister of Canada and Federica Mogherini, the High Representative of the EU for Foreign Affairs and Security Policy discussed the current issues, including the situations in Myanmar, Ukraine, and Iran as the Foreign Ministry of Canada reported on Twitter. "Minister Freeland met with Federica Mogherini to talk global peace and security and the rules-based international order. They discussed plans for the September Women Foreign Ministers’ Meeting, as well as ongoing international issues, including situations in Myanmar, Ukraine, and Iran," the message said.